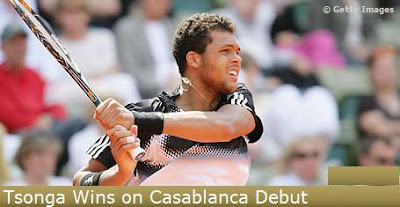 Top seed Jo-Wilfried Tsonga won his debut match at the Grand Prix Hassan II on Monday, defeating Spaniard Albert Montanes 6-4, 7-6(10). The Frenchman converted one of three break points and was dominant on serve winning 76% of points. The 22-year-old Tsonga began the year in fine form, making the semifinals in Adelaide (l. to Nieminen) before going on to reach his first Grand Slam final at the Australian Open (l. to Djokovic). However, he stands at just 2-2 on clay for the season. World No. 56 Montanes, who reached his first ATP Masters Series quarterfinal in Hamburg last week, now slips to 10-12 for the season. Second seed Gael Monfils joined Tsonga in the second round, firing eight aces in battling past Spaniard Guillermo Garcia-Lopez 6-7(8), 7-5, 6-0 in 2hr., 3min. The 21-year-old, who is making his debut in Casablanca, is playing in his first ATP event since falling first round to Igor Andreev in Munich last month, although last week he won a Challenger title in Marrakech. Former champion Younes El Aynaoui upset eighth-seeded Romanian Victor Hanescu 6-2, 6-7(6), 6-3 to book his spot in the second round. The Moroccan fired 12 aces and converted four of eight break points to secure the victory in 2hr., 9min. The 35-year-old wild card is making his 13th appearance at the event, having lifted the trophy in 2002 (d. Canas), while also finishing runner-up in 1995 and 2003. Currently No. 189 in the South African Airways ATP Rankings (former No. 14 – Nov. 2003), El Aynaoui is contesting just his second ATP event of the season after reaching the semifinals in Munich (l. to Gonzalez). World No. 76 Hanescu has now lost first round on all three of his visits to Casablanca.